Zahabiya Excel Bond ZGPA -7/223 (Special) is water borne, rubber & acrylic co-polymer based air drying coating & bonding white adhesive with numerous applications. In HVACR field, it is effectively used for almost all the bonding, fixing, laminating, coating & sizing applications. 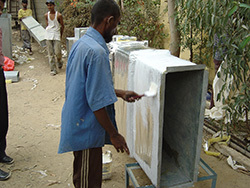 Insulation’s such as styrofoam, glass-wool, polyurethane etc. can be very effectively bonded with this adhesive on metals, unaffected even by the relative humidity up to 90% for long spells. It is also used as an anti-fungus adhesive for pasting of glass cloth, asbestos cloth and other fabric coverings of thermal insulation’s. The bond attained is waterproof, unaffected with weather/ climatic changes and resistant to fungal growth. The product being water based is perfectly safe in handling and therefore very safely and effectively replaces conventional solvent based toxic & flammable adhesives. The product conforms to the VOC requirements of LEED IEQ 4.1 – Low Emitting Materials: Adhesives & Sealants. Hot & cold waterproof (D3). Mildew, fungi and micro-organism resistant. Temperature resistance from -10°C to 90°C.